Are you searching for the best eye mask for sleeping? Do the sleep masks you typically buy slip off your face at night? Do you suffer from insomnia and need a good sleep mask to get some rest? Well, don’t worry because you’re not alone.More than one-third of American adults suffer from sleep disorders or regularly sleep less than eight hours a night. This is often caused by environmental stressors such as city lights, traffic noise, loud neighbors, and more. Some individuals take prescription pills to solve their problems, while others turn to sleeping masks. Both are cheap and effective solutions, however,drugs may inhibit your brain’s ability to slip into REM sleep. To stay safe and healthy, it’s highly suggested that you try a quality sleeping mask before turning to prescription pills. Here are a few options for an affordable and effective sleeping mask. When choosing a quality sleeping mask, you should look for a product that’s comfortable, durable, and great at filtering light. There are multiple factors that can determine which sleep mask is perfect for you. Thankfully, we’ve composed a list of the best eye masks for sleeping and the materials used in designing them. The Dream Zone eye mask contains a combination of silk and cotton for luring you into a deep night’s sleep. With a soft silk exterior and thick cotton interior, the Dream Zone eye mask is both elegant and luxurious. The Dream Zone eye mask utilizes a Velcro/elastic band that can be adjusted to any size. This means that it won’t snag in your hair or slip off your head during the night. This eye mask is not only comfortable but great for filtering out all types of light, including LED. It can work anywhere including on planes and in hotels for impromptu naps. The Everest Essentials﻿﻿’ ﻿﻿Sleep mask guarantees 100% satisfaction and a goodnight’s sleep. It’s great for a mid-day nap, LED light, and bright TV broadcasts. It also comes with a 30-day money back guarantee. If you’re unhappy with the Everest Essentials’ Sleep mask, simply return it for a full refund. This eye mask comes with an elegant travel bag and a pair of ear plugs. The mask, itself, comes with an adjustable strap for a perfect fit. The mask is also machined washable which means that it can be reused without gathering dirt or allergens. It’s designed with a high-quality silk material that soothes your eyes while you sleep. The Everest Essential’s Sleep mask is truly one of the best sleep mask currently available. The Brownmed IMAK eye mask is designed by doctors to relieve stress and eye pain while eliminating light exposure. It’s crafted with a mixture of cotton and ergo beads to soothe even the worst of migraines. To use, simply keep the IMAK eye mask in your home freezer until the ergo beads grow hard. The beads stay cool and refreshing for up to thirty minutes when in use. This sleeping mask is great for those who suffer from insomnia or other sleep disorders. It utilizes reliable and effective straps that are adjustable and easy to use. It’s designed to not only be relieve stress and head pain but to also last years of regular use. T﻿﻿he Sleep Master Deluxe TM is small, lightweight, and breathable. Designed with a cool satin fabric, it relieves stress while aiding in a restful night’s sleep. This eye mask muffles sound and light with its padded lining and comes with high-quality, easy-insert-able ear plugs. It’s thin, yet durable elastic straps fit any head comfortably but secures the eye mask for a long nights sleep. The Sleep Master DeluxeTM comes with a 30-day guarantee. If you don’t like this sleeping mask, then you can return it for a full refund. However, we believe that this eye mask is guaranteed to provide you a relaxing night’s sleep for years. The Bedtime Bliss BTB01 has received numerous positive reviews from customers for its lightweight, quality design. Made from soft velvet, Bedtime Bliss BTB01 relieves pressure on the eyes while soothing the head for a good night’s rest. Its strap is adjustable, which means that it doesn’t snag on the hair during the night. It’s contoured which allows for space above the eyes, as well as, allow for air flow. It’s a great, cheap gift for those who suffer from insomnia or any other sleep disorder. The Alaska Bear® sleep mask is one of the best sleep masks for a good night’s rest. It’s made of top quality natural mulberry silk that helps to sooth and cool the skin. Not only that, but its headband is adjustable and tangle-free, unlike most masks that use Velcro straps. The band is extendable from 15.8 inches to 27.6 inches long. This allows for versatility when using the Alaska Bear ®Natural Silk eye mask. This eye mask is both comfortable and hypoallergenic, which makes it a healthy, and yet preferable choice. It also comes with a thirty day, money back guarantee in case you’re not satisfied. G7 has designed and manufactured some of the best sleep masks currently on the market. T﻿﻿he G7 Sleep Tight eye Mask utilizes a soft malleable material that adjusts to the subtle contours of your face. Breathable and lightweight, its elastic strand helps the eye mask grip your face while you sleep at night. It’s a wonderful eye cover for filtering out 100% of LED and daylight. 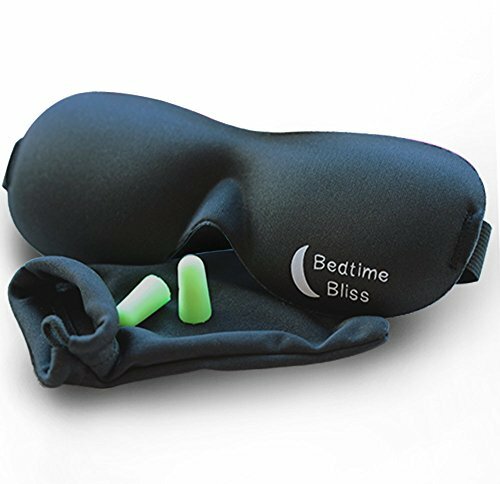 The G7 Sleep Mask also comes with a pair of foam earplugs that block out invasive noise. It also comes with a storable silk carrying case. Machine washable, the manufacturer recommends sending the eye cover through a warm cycle after receiving it. This should ensure that the sleep mask stays soft and pliable for years. Just in case you’re unhappy with the product, the G7 Sleep Mask comes with a 7-day full refund. The Drift to Sleep Black Eye Mask is a prime-quality product and currently, one of the best sleep masks available. Guaranteed to block 100% of light, this eye cover is machine washable and comes with a money back guarantee. This night mask is designed with contoured eye pockets that relieve pressure and irritation from your face. Not only that, but it comes with an adjustable Velcro strap and two pairs of foam ear plugs. The Drift to Sleep Black Eye Mask is not only durable, but also affordable. Its adjustable strap keeps the mask snugly in place, while the contoured pockets are both breathable and comfortable. Overall, it’s a great product for a great price. The Sleep Restoration® Contoured Sleep Mask is a high-quality product great for meditation, yoga, daytime naps, and traveling. Utilizing a durable, yet soft polyester material, this sleep mask is guaranteed to last you years of use. However, in case you’re unhappy with the product, it comes with a 90-day money back guarantee. Boasting breathable and lightweight contoured eye pockets, this sleep mask is both comfortable and relaxing. It also comes with Moldex brand ear plugs that mold to fit the contours of your inner ear. This reliably blocks out even more invasive noise than any common ear plug. With an adjustable Velcro strap, the Sleep Restoration® Contoured Sleep Mask can fit any size and any age. The Hamalaya Sleep Mask is both classy and comfortable. Designed with 100% pure silk and super cushy padding, it’s a lightweight, breathable eye mask for sleeping. Equipped with an adjustable strap and side buckle, it provides ultimate protection from the sun and LED light. Unfortunately, this sleep mask does not come with a pair of earplugs for blocking out noise. It does, however, come with a lightweight satin carrying bag for travel sleeping. The Kinzi Dream Weave Sleep Mask is an all-in-one package. Designed with a soft velvet lining, it’s both lightweight and malleable. It also features contoured eye pockets for breathability and comfort. With a handy Velcro strap, the Kinzi Dream Weaver can snuggly fit any size without slipping off during the night. It also comes with a pair of pliable foam plexo ear plugs and a lightweight carrying pouch. This sleep mask is perfect for any place or situation, including yoga, meditation, or daytime naps. It’s a reliable and durable eye mask that’s guaranteed to provide you years of long, relaxing sleep. The Tempur-Pedic Sleep Mask is simple, yet effective at blocking out light. Made from a soft, cotton-like fabric, it’s a bit bulky but can mold to the shape of your face. Its eyelids are padded and contoured a bit to allow breathability and comfort. It also utilizes Velcro straps to keep it latched onto your head throughout the night. Because of its bulk and thick material, the Tempur-Pedic Sleep mask may become a bit hot in warm climates. Overall, this sleep mask is a high-quality product that can bring you years of well-earned rest. What is the Perfect Sleep Mask for Travel? Traveling can be hard. Slipping between time zones can leave you weary, cranky, and desperately in need of a good, long nap. However, how can you sleep with sunlight blazing through your window and the irritant sound of traffic keeping you awake? This is when a reliable sleep mask comes in handy. The best sleep mask for traveling should feature a comfortable, breathable fabric and an adjustable strap. It should also come with a pair of reliable ear plugs and a lightweight pouch to carry it all. Anything less, simply wouldn’t be the best. That’s why we chose Dream Essentials Travel and Sleep Mask as the best sleep mask for traveling. Dream Essentials simply excels at designing and manufacturing eye masks. The Travel and Sleep Mask features a natural cotton lining for those with sensitive skin. It also utilizes concaved eye pockets to relieve pressure and allow air to flow through the mask. Its Velcro band is adjustable and does a wonderful job of securing the mask to your face while you sleep. The band also prevents snagging in hair and can fit any size or age. The Dream Essentials Travel and Sleep Mask is a healthy and effective alternative to prescription or over-the-counter sleep aids. It comes with a lightweight satin carrying pouch, as well as, pliable soft earplugs for filtering out noise. Overall, this eye mask is an affordable, effective, and reliable option for those who need a good night’s rest. What is the Best Choice of Fabric for Sleep Masks? There are quite a few factors to consider when choosing the best eye mask for sleeping. Its ability to filter out light is, of course, one of them, as well as, its durability. However, it doesn’t matter how well the eye mask blocks out light if you can’t fall asleep. That’s why the choice of fabric and material is most likely the most important factor to take into consideration. Velvet is an incredibly popular choice in sleep masks. It’s breathable and luxurious, not to mention soft and great at holding in heat. It’s a very classy and lightweight fabric that’s safe for individuals with sensitive skin to use. Unfortunately, it tends to collect dust and dirt easily. Silk is luxurious, lightweight, and breathable. It’s an ultra-soft, comfortable material that’s resistant to mold and moisture. In fact, silk can absorb 30% of its weight in water before dampening. However, silk is a bit more expensive than most fabrics and can gather wet stains like crazy. Cotton is lightweight, breathable, and cheap. It’s a natural option that can absorb moisture and sweat while you sleep. It’s soft and perfect for those who suffer from allergies or have sensitive skin. However, cotton is not very durable and is susceptible to mold or mildew. Make sure that your sleep mask is washable by either hand or machine. Polyester is made of a mixture of plant cuticles, natural chemicals, and synthetics. It’s extremely durable, stain-proof, and works very well at blocking out light. It’s also resistant to mold or mildew and requires little soap or washing. However, polyester is neither breathable nor attractive. It has a slightly scruffy appearance due to its semi-plastic design and has the tendency to overheat. Satin is a glossy, soft, and sleek material that is both durable and lovely to look at. Its lightweight nature makes it a popular option for eye masks. Unfortunately, Satin is not very breathable and it doesn’t absorb moisture as well as other fabrics. It also wrinkles easily and doesn’t stretch well. Memory foam or low-resilience polyurethane foam is a popular option for most sleep-related products. Dense, soft, and extremely absorbent, memory foam is an incredibly comfortable material that’s guaranteed to help you sleep. Products that utilize memory foam have the ability to mold and bend to the contours of the consumer’s bodies. Not only that, but this fabric is durable and requires little maintenance. Unfortunately, memory foam is highly combustible and not very breathable. Mulberry silk is a common type of silk, making up 90% of silk production, globally. Luxurious and lightweight, it’s hypoallergenic and great for individuals with sensitive skin. Super-absorbent, Mulberry silk is durable and resilient to large amounts of moisture. Breathable and flexible, this fabric is a great eco-friendly and natural alternative to other fabric types. On the downside, Mulberry silk is very fragile and has the tendency to shrink. Eye masks that contain this type of fabric aren’t machine washable. These are the most common fabrics used in the best eye masks currently on the market. Out of these options, I’d say that eye masks made of Velvet tend to work the best. Soft, lightweight, and durable, velvet is a great fabric choice for choosing the best eye mask for sleeping. Our second choice would be Mulberry silk. It’s not only attractive but also comfortable. Its breathable nature, flexibility, and ability to absorb excess moisture make it a great option for sleep masks. Why Buy Eye Covers for Sleeping? About one-third of American adults don’t get enough sleep on a daily basis. This is caused by a variety of situations, such as stress, irregular work hours, traveling, newborn babies, or insomnia. No matter the reason, the National Sleep Foundation has determined that adults need 7-9 hours of rest a day. If you’re not reaching these goals, then you put yourself at risk for disease, increased stressed and other health problems. A reliable eye mask can help filter out external factors that contribute to your lack of sleep. They can provide a comfortable noise and light-free environment that can help you fall asleep and stay asleep. You see, sleep is regulated by the circadian rhythm or biological clock. Our internal biological clock tells us when it’s time to wake up and when it’s time to sleep. It does this by receiving signals from the Suprachiasmatic Nucleus (SCN). The SCN is a part of our brain that responds to light and darkness. When it’s bright out, the SCN sends signals to stop the release of melatonin, a hormone that causes sleep. When it’s dark, SCN signals for more melatonin, so we can sleep. When you try to sleep in a bright or noisy environment, your SCN won’t signal for an increase of melatonin. This explains why it can be difficult to fall asleep in the middle of a bright, sunny day. It’s also important to know that constant circadian disruptions can cause severe health issues or sleep disorders. Lack of sleep can cause hallucinations, stress, and disorientation. This is why a reliable sleep mask can be a valuable product for even those who don’t suffer from sleep problems. A good sleep mask can protect not only your heath but also your biological clock. It filters out intrusive light which allows for your SCN to effectively signal your brain when it’s time to sleep. Also, a pair of noise-filtering ear plugs keeps intrusive noise from waking you up. This allows you to get a full eight hours of rest without worry or hurting your biological clock. There are so many factors that go into choosing the perfect sleep mask, such as comfort, durability, and effectiveness. Of course, it really depends on personal preference. You may favor one brand, while your friend likes another. It all depends on what you’re looking for in the best sleep mask. After reviewing our choices, we decided that the Bedtime Bliss BTB01 is the best sleep mask currently available. The Bedtime Bliss features a lightweight design and contoured pockets to relieve stress on the eyes. It’s made of a breathable fabric that molds and fits to your face perfectly while blocking out 100% of light. It also comes with convenient carrying case and a pair of Moldex brand earplugs. Its adjustable Velcro strap clings tightly, yet comfortably to your head while you sleep- keeping the mask firmly in place. The Bedtime Bliss BTB01 is a great reliable product that can guarantee a great night’s sleep for any airplane traveler. If you want to buy a sleep mask or you already did, don't hesitate to leave a review on comparoid.com.